The Best Potato Salad Recipe In the Entire World! This is the best potato salad recipe you will ever try, and trust me, we have tried a lot of potato salad recipes. The key to this recipe is the type of potato you use and the philosophy of not overdoing the sauce. We want the potatoes and the vegetables to be the star of this dish. Oh yeah, I almost forgot. We use bacon too, and everything tastes better with bacon. A common mistake people make (in my humble opinion) when it comes to potato salad recipes is a blatant overuse of mayo (or worse yet fake mayo) and mustard. Typically a normal baked potato is used as well, which has to be peeled, and comes out kind of gritty and grainy. The potatoes we use for the best potato salad recipe are the smaller red potatoes, which have a thinner skin that is left on the potato, and a smoother, waxier texture. Don't forget to view the instructional video below. First, have some crispy cooked bacon on hand, five or six slices, as well as three or four hard boiled eggs. Boil about three pounds of red "new" potatoes. The way to do this properly is to place the potatoes in cold water with a teaspoon or so of salt, and bring the water to a boil. Then, turn the heat down to a simmer and allow them to cook until the potatoes are just "fork tender," which is 15 minutes or so. Just keep testing them. The reason you start with cold water instead of dumping the potatoes into boiling water is that they cook more evenly when brought up to the boiling point versus being tossed into the boiling water. Once they are done cooking, drain them and allow them to cool to the point where they can be easily handled. Quarter the potatoes and cut each egg into six or eight pieces. Place the potatoes and eggs in a large serving bowl. Now, time to make the dressing. All of this is by feel, so you can tweak the recipe to your liking. Fold the dressing and the crispy bacon into the potatoes and eggs. Top with fresh parsley. Click Here to ask Dave a question about this recipe. 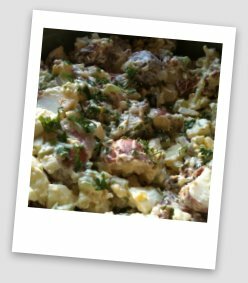 Click Here to Leave Best Potato Salad Recipe and Return to BBQ-My-Way.com Home Page. Click Here to Leave Best Potato Salad Recipe and Return to Side Dish Recipes.